People have been telling us for years that we should visit Branson, Missouri and the Ozarks. After visiting ourselves, we’re now the ones raving about this delightful tourist destination! 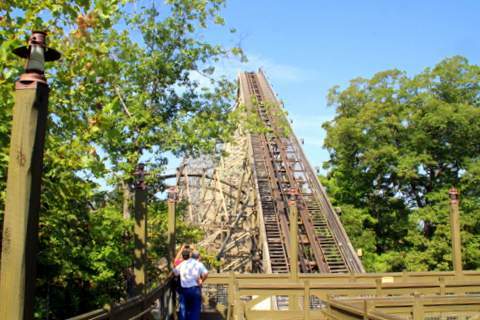 One of our favorite Branson attractions is Silver Dollar City. Living in the Orlando area, we know all about theme parks. So, trust us when we say that Silver Dollar City is something special. Silver Dollar City is a theme park designed to allow guests to step into an 1880’s era town complete with a marshal, a blacksmith, musicians, craftsmen and craftswomen, cowboy cooks, cowboy shows and enough modern rides to thrill all ages. We enjoyed watching blacksmiths, glass blowers, stunt riders, bullwhip artists, and Native American dancers just to name a few. We even got to meet actor / artist Buck Taylor who starred in Gunsmoke and Tombstone! The admission price of Silver Dollar City is about one half of what you can expect to pay at other amusement / theme parks and the in-park food prices are lower than any others we have seen. Not only is Silver Dollar City an amazing experience, it is an amazing bargain. FIREMAN’S LANDING: Added in 2015, Fireman’s Landing carries the theme of an 1880s firefighter volunteer recruitment fair, modeled after a community fair of a century ago, saluting the spirit and training activities of volunteer firefighters. The rides serve as “training” adventures for recruits and community heroes, seeking to become part of the Silver Dollar City Fire Brigade through fire spotting, pole sliding, and height & drop training. * Fireman’s Flyer, a low-flying swing ride for little firefighters. * Firefighter’s Junior Fire Escape, a soft play area for toddlers. OUTLAW RUN: Thrill ride enthusiasts around the world marked a first-of-its-kind ride debut at Silver Dollar City as the park made history with the opening of Outlaw Run, the world’s most daring wood coaster. The $10 million ride, named Best New Ride of 2013 worldwide,* sends passengers soaring through the Ozark Mountains on a ground-breaking wood coaster that includes several firsts. Outlaw Run features the world’s first and only double barrel roll on a wood coaster, with a 720-degree (double) barrel roll. It is the only wood coaster to twist upside down with a record-breaking three inversions; and at its 2013 debut, it was the world’s steepest wood coaster with a first drop of 162 feet (more than 16 stories) at 81 degrees and is noted for that in 2015 Guinness World Records 2015; and the second fastest wood coaster in the world, reaching a top speed of 68 miles per hour. POWDERKEG: One of Silver Dollar City’s most popular rides, PowderKeg shoots riders into a thrill zone within seconds of climbing aboard, launching them from 0 to 53 miles per hour in just 2.8 seconds. This explosive-launch roller coaster was profiled as a top ten ride for thrill-seekers in the Wall Street Journal and named the “Best Family Thrill Coaster on the Planet” by ThrillRide.com. Constructed within the forests of the Ozark Mountains and winding down a hillside, PowderKeg is a family thrill ride unlike any other in the history of the park. WILDFIRE: WildFire is a high flying, multi-looping, cobra rolling roller coaster that offers high thrills with a vertical drop of 15 stories, into a half-loop/half-roll, then a full loop, followed by a cobra roll with two back-to-back inversions, a corkscrew and high speed spiral, traveling at speeds up to 66 miles per hour. THE GIANT BARN SWING: This swing launches riders more than seven stories in the air 75 feet high, nearly upside down with a 230 degree arc, and at speeds up to 45 miles per hour for barn-bursting, high-flying, super-swooping thrills. The tremendous acceleration produces back-to-back G-force kicks and sensations of weightlessness for a full-throttle thrill ride. The Giant Swing is set in the Great Barn area of the park, along with two additional rides, High-Low Silos, interactive climbing towers where riders use rope-pulls to propel themselves over 30 feet in the air. TOM & HUCK’S RIVERBLAST: Silver Dollar City’s $7 million ride Tom & Huck’s RiverBlast is a super-soaking water raft ride themed around the adventures of Tom Sawyer and Huck Finn. Raft riders, armed with water soakers, battled raft-to-raft and raft-to-shore, while dodging streams from shore shooters too. With hundreds of water features, this is America’s Biggest Water Battle. 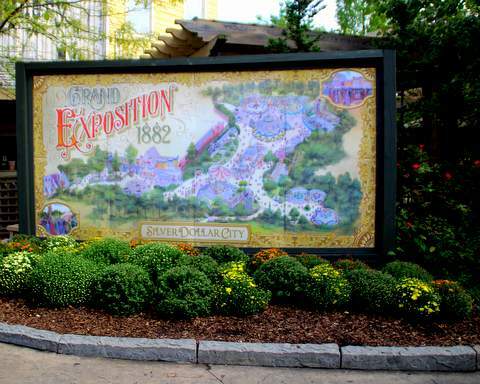 THE GRAND EXPOSITION: With theming inspired by the world’s fairs and expositions of more than 100 years ago, the Grand Exposition has 10 family rides in a two-acre area of the park. From the high-flying swing ride to a family-sized coaster, there are seven rides that parents can ride with their kids, and three rides that smaller kids ride alone. THUNDERATION: This runaway mine train takes riders on a run through the treetops. Thunderation is an 80-foot tall, 48-mile per hour high-speed coaster with a spiraling 81 foot drop into an underground tunnel. FIRE-IN-THE-HOLE: This indoor dark coaster offers high-speed drops and turns, as the ride tells the story of the Baldknobbers who burned the mining town Marmaros, the site of the current Silver Dollar City Square, in the late 1800s. AMERICAN PLUNGE: Riders climb more than five stories into the Ozark sky and splash down at speeds reaching 35 miles per hour. This traditional log flume ride offers a river ride plus splashdown thrills. LOST RIVER OF THE OZARKS: The family can ride together as the fastest whitewater in the Ozarks propels riders down a raging lost river with numerous turns, twists and drops, with plenty of opportunities to get soaked. THE FLOODED MINE: The warden needs help. The prisoners have taken control of the prison. Guests ride ore cart boats through dark, flooded mine shafts, past jack hammers, pump stations and sleeping guards. Riders have laser shooters for target shooting throughout, with arcade-style shoot-out fun. HALF DOLLAR HOLLER: Adventure rules at Silver Dollar City with Half Dollar Holler. This super-sized play area for little explorers has treetop funhouses and climbing nets, box crawls and slides, plus truckloads of sand for hands-on play. The centerpiece is a vintage classic: Silver Dollar City’s carousel with hand-carved horses, mules and whimsical woodland creatures to ride. This million dollar play area is designed for kids up to age 7. FRISCO SILVER DOLLAR LINE STEAM TRAIN: A beautiful 20-minute ride on an authentic steam train takes riders through the Ozark countryside. Train robbers interrupt the ride with a humorous skit that is part of park history and a tradition enjoyed by generations. MARVEL CAVE: Marvel Cave, a registered National Natural Landmark, is a wet limestone cave, with formations that are still alive and growing. One of the first attractions in what would become Branson, the historic cave was discovered by the Osage tribe in 1500, described by geologists in the 1860s and explored by adventurers in the 1880s before being opened to tours in 1894. The stairway in and the cave train at the exit were added in the 1950s, and Silver Dollar City was originally an “add-on” for cave visitors before growing into a major theme park. Guests on walk-through tours descend 300 feet below the surface into the 20-story Cathedral Room, the largest cave entrance room in the United States, and see formations such as the 55-foot tall Liberty Bell and the 70-foot flowstone Blondie’s Throne, plus features including the winding Serpentine Passage, and the Waterfall Room 500 feet below the surface with an underground waterfall 50 feet high. Tours depart every 30 minutes most days. Special Lantern Light Tours offered once each day allow guests to step back in time and explore Marvel Cave by lantern light. Lantern Light Tours include a trek to the Mammoth Cave Room, closed to the public for the past 50 years. GRANDFATHER’S MANSION: A two-level walk-through attraction, guests laugh their way through mystifying rooms with slanting floors, mirrored walls and dizzying effects that seem to turn the world upside down. * Spring Ride Days, March 15, 16, 17, 18, 19, 22, 23, 24, 25, and 26, 31, and April 2. Ride to your heart’s content, and watch out for a daily surprise throughout the festival! * Young Christians Weekend, April 1 - 2, is a special weekend for youth, and also one of those times when the park hosts lots of teenagers, so plan accordingly! * New – Festival of Wonder, April 6 – April 30, an incredible new entertainment experience…from the world’s longest playable stringed instrument to the spectacular footwork and acrobatic artistry of the seven Flamenco Kings and many more, every show is guaranteed to be a wow. Even your taste buds will be amazed with new and innovative flavors and incredible eats during this All-NEW Festival! * The Bluegrass & BBQ Festival, May 4 - 29, adds 6 days to this popular festival for 2016! A celebrity concert kicks-off the festival on May 7, and chart-topping favorites, like Doyle Lawson and Rhonda Vincent, appear on other dates. * The Star Spangled Summer, June 3 - July 16, celebrates the 90th birthday of the world famous wizards of the basketball court, the Harlem Globetrotters, and brings back The Magic of Peter Gossamer – Up Close and Personal. * Moonlight Madness, July 15 – July 30, is when “Silver Dollar City” stays open late, holds fun street dances, and delivers an epic fireworks finale in Echo Hollow. * A Southern Gospel Picnic, August 24 -September 4, brings the park to church, the country fair, the grand stage, the family backyard - with superb Southern Gospel music and savory southern cooking! * Country Music Weekend, September 8 - 10, hosts 3 legendary country music icons in concert at Echo Hollow. * The National Harvest & Cowboy Festival, September 13 – October 28, showcases the largest gathering of demonstrating craftsmen in the country, and the Wild West Show returns with an all new signature act! * An Old Time Christmas, November 4 - December 30, celebrates the reason for the season with millions of sparkling lights everywhere, special holiday treats and music, a Christmas parade, and the magical and enchanting five-story special effects Christmas tree in the square! Silver Dollar City allows guests to step into an 1880’s era town complete with a marshal, a blacksmith, musicians, craftsmen and craftswomen, cowboy cooks, cowboy shows and enough modern rides to thrill all ages. Trust us when we say that Silver Dollar City is something special. Silver Dollar City is located at 399 Silver Dollar City Parkway, Branson, MO 65616.